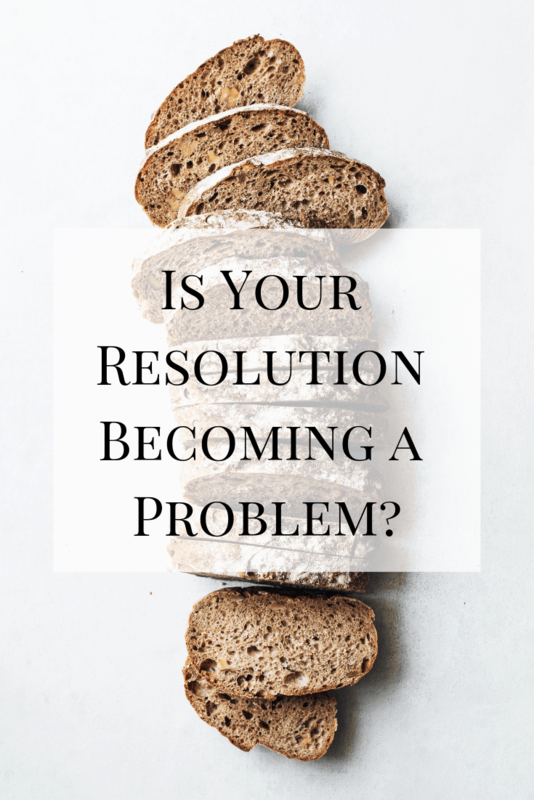 Is Your Resolution Becoming a Problem? Most articles I read about new year’s resolutions involve the propensity of people to abandon them after a period of time. The most common resolutions revolve around getting healthier — more exercise, cleaner eating, and just being more conscious of what we take into our bodies. For the sake of simplicity, those resolutions are what I’m focusing on in this post. It’s common knowledge that many people fall off the resolution wagon relatively early. What happens, however, when you manage to stick to a resolution a little too well? When exercise starts taking over parts of your life or you’re spending way too much time thinking about what to eat and when to eat it? I can personally attest to all of the following because I’ve been there. I’ve written about my issues with food and exercise following the cessation of my drug and alcohol abuse, and it’s important to understand that there IS too much of a good thing. Here are some signs that your healthy resolution may be becoming a problem. Do you cancel or avoid plans with friends in favor of exercise or food? Does the thought of going out to eat cause you anxiety because you don’t know if there will be anything healthy or because you don’t know all the ingredients of a meal? When you social life starts to suffer, it’s time to reevaluate your relationship with exercise/food. In the past, I would spend most of my day thinking about my next workout or planning out my day and week of food choices. There’s nothing inherently wrong with these things while trying to switch to a healthier lifestyle, but I would literally think about them ALL DAY. If Neil wanted to go out to dinner, I would spend time at work looking up menus to try and figure out if there was anything healthy enough for me to eat. I would obsess over how many nuts I was snacking on. I would worry about what other people thought about me if I chose to eat certain things, healthy or not. Take a look at how much time you spend thinking about exercise or food. It may be more than you think. Taking your suffering social life one step further, does food or exercise preoccupation lead you to experience negative consequences? Are you losing friends in exchange for more time at the gym? Is your work affected? Have friends or loved ones started making comments or expressing concern at your new behavior patterns? Ask yourself if your behaviors are causing negative consequences in your life that you’d rather avoid. REST IS IMPORTANT. Your body needs it to repair and grow your muscles so that the next time you work out, you’re stronger and more prepared than before. There are some cases when working out when sick is fine, but most of the time it’s a better choice to skip the workout and let your body heal. Working out when you’re exhausted may be a sign of overtraining. You also aren’t able to work to your full potential, which means that you’re not even getting the results you want from your workout. I would ignore these signs and work out anyway, which eventually led to a stress fracture in my leg that FORCED me to sit things out until it healed. Rest won’t kill you, but overtraining will definitely get you there sooner. If you eat a cupcake that someone brought in for work, do you immediately start calculating what foods you need to cut or how much longer you need to exercise the next time you’re at the gym? Equating food with caloric values or exercise equivalents is a quick trip to disordered eating or exercising. It takes the joy out of eating, which is something that makes me very sad to hear. The next time you enjoy a dessert or a meal that you have no idea of the ingredients, simply enjoy it. Don’t convert it into a way to punish yourself later. At the height of my exercise obsession, I had started an “exercise” Google calendar with the sole purpose of tracking mileage and time. I recorded each day’s run on the calendar and analyzed my performance each time. If I ran shorter or slower than a day before, it became my mission to beat those distances and times the next time I ran. I was a slave to my Garmin watch and freaked out if I had to run without it. It felt like that run simply didn’t count and whatever movement I had done was wasted because I couldn’t record the data associated with it. It’s one thing to miss a workout, feel a little bummed, and move on. It’s another thing to miss a workout and dwell on that fact for the rest of the day. In the past, if I had to miss a regular workout because of circumstances out of my control (the gym was closed, my car wouldn’t start, I had to go into work, etc. ), I would stress for the rest of the day about what I had missed and how far I had set myself back. If I had the opportunity the next day, I would try and do two workouts to make up for the one I had missed. This week, I wasn’t able to make it to the gym because we got hit with more snow than normal. I took it as an opportunity to sleep in, cuddle with my dog, and that was it. I accepted that fact and went on with the rest of the day. If your food or fitness routine gets messed up, pay attention to how you respond to it. Dwelling for too long on either may be an indication that you need to take a look at your relationship with them. When I would have a good workout or make myself so sore that it hurt to move for two days (not really what you should be aiming for), I felt great about myself. I felt like I was on the way to looking the way I wanted to, which meant that I could feel worthy. When I successfully got through a day with only my lean proteins, bags of snackable spinach and mushrooms, and minimal fruit, I knew that I wasn’t going to gain weight. When either of those didn’t happen, I felt like a failure. I shamed myself into thinking that I wasn’t worth anything. Today, during that same day I wasn’t able to go to the gym, I had three cookies with my breakfast and my tea. I had a lot of work to get done, so I spent a lot of time sitting in front my computer, then watching TV with Neil in the evening. I ate some healthy meals and also some peanut butter cups. Not once did I reflect on those things I ate and the workout I didn’t do and let it affect who I was as a person. I’ve learned that the way I look on the outside has nothing to do with the confidence level I can possess from the inside. I am far more than my appearance, and so are you. And this is why I tend not to make fitness-related resolutions! I had such a bad relationship with eating for so many years… I just try and eat intuitively nowadays! Learning how to make my fitness-related goals fit into my life instead of the other way around made everything better for me including my workouts. I believe that is what is commonly referred to as a “lifestyle approach” and I think most people would benefit from that.